As you manage your advertising across digital channels, you can find that you spend too much time in too many tools with too little to show for it. We solve these pains with Adobe Advertising Cloud — a single foundation for media buying across all channels, from search and display, to video and programmatic TV. 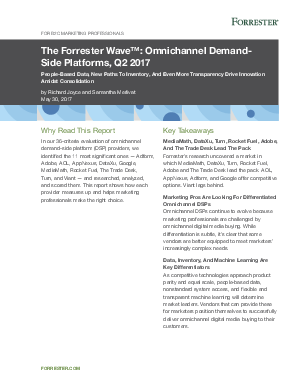 In The Forrester Wave™: Omnichannel Demand-Side Platforms, Q2 2017, Advertising Cloud received the highest scores possible in 14 criteria, including data quality, dynamic creative optimization (DCO), inventory quality, and more. Find out why we think Adobe Advertising Cloud’s current offering, product strategy, and market presence contribute to our being named a Leader in Demand-Side Platforms in this latest Forrester Wave.